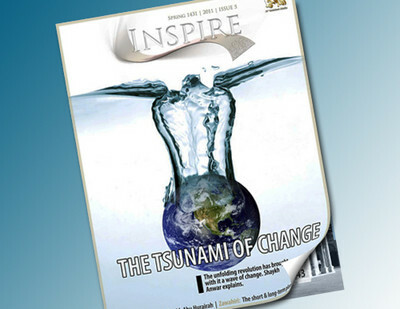 Al-Qaida in the Arabian Peninsula released its fifth issue of Inspire Magazine, with a clear explanation of its views about upheaval in the Middle East and what that means for the organization's aim to retake the Holy Land. While uprisings in Bahrain, Egypt and elsewhere in the region have been peaceful, several articles in the issue stake the claim that such popular actions somehow validate al-Qaida's violent ethos. "The cover of this issue is about the Tsunami of change that is sweeping the Arab world. With the removal of the despots, the ummah [nation] will speak its voice, and when it does, it will chant: Here we start and in al-Aqsa [Jerusalem] we'll meet," says Yahya Ibrahim in the introductory article. "The biggest barrier between the mujahidin and freeing al-Aqsa were the tyrant rulers. Now that the friends of America and Israel are being mopped out one after the other, our aspirations are great that the path between us and al-Aqsa is clearing up." "The West also believes that the revolts are bad for al-Qaida. This is not the case," the article clarifies. The overthrow of Arab regimes is being taken as a new wind in the sails of the terrorist movement, empowering it to take bolder strikes at the West and Israel. "Another line that is being pushed by Western leaders is that because the protests in Egypt and Tunisia were peaceful, they proved al-Qaida – which calls for armed struggle – to be wrong. That is another fallacy. Al-Qaida is not against regime changes through protests but is against the idea that the change should be only through peaceful means to the exclusion of the use of force." "It is our opinion that the revolutions that are shaking the thrones of dictators are good for the Muslims, good for the mujahidin and bad for the Imperialists of the West and their henchmen in the Muslim world." American-born al-Qaida cleric Anwar al-Awlaki called for Muslims to realize the significance of the revolutions to the international jihad movement. "The first and probably most important change that this monumental event brought is a mental one. It brought a change to the collective mind of the ummah. The revolution broke the barriers of fear in the hearts and minds that the tyrants couldn't be removed." "We do not know yet what the outcome [of the revolutions] would be, and we do not have to… Regardless of the outcome, whether it is an Islamic government or the likes of al-Baradi [al-Baradai], Amr Mousa or another military figure; whatever this outcome is, our mujahidin brothers in Tunisia, Egypt, Libya and the rest of the Muslim world will get a chance to breathe again after three decades of suffocation." Newfound freedoms in the Arab world would also mean unrestricted movement and communications for the ideologues of terror. "If one would trace back the roots of today's jihad movement, one would see clearly the strong influence of the Egyptian Islamic movement," Awlaki said. "It was Sayyid Qutb and then the Egyptian Jihad that represented the ideological basis for today's jihad work. For the scholars and activists of Egypt to be able to speak again freely, it would represent a great leap forward for the mujahidin." Sayyid Qutb was a primary a major scholar of the Muslim Brotherhood, and a driving force behind the current jihad movement. Although the Muslim Brotherhood and al-Qaida are often seen as competitive movements, the magazine makes reference to Qutb, who is popular with both groups for advocating an end to reliance on the West and jihad. It even makes a veiled reference to modern MB ideologue Yusuf al-Qaradawi, in a positive way, stating, "Now that Hosni [Mubarak] is gone, we heard the Imam of the Friday prayers praying: 'O Allah we ask you to allow us to meet in al-Aqsa,' and the millions in Tahrir square roared with one voice: Amin." The magazine also illustrates al-Qaida's changing attitude on issues like mobilizing the masses and communicating their message to Western audiences. "If this Egyptian revolution has taught us anything, it has taught us that sitting and waiting for tyrants to fall is not practical; mobilization of the people is necessary for the tyrants to give in," writer Abu Suhail notes in "The Way Forward." 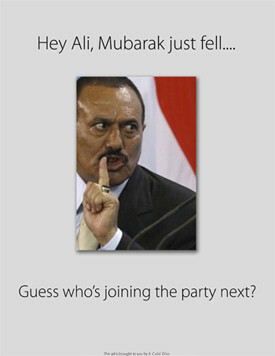 And it gives practical advice that the next to be overthrown by the masses will be Yemeni President Ali Abdullah Saleh, saying, "Hey Ali, Mubarak just fell… Guess who's joining the party next?" "This is what your brothers in the al-Qaida Organization and other jihadi organizations have been working for: inspiring the people all over the world to rise up for the Islamic cause of eliminating tyrants so that we have a clear shot at Israel." "It is a collective effort that requires the ummah to be on the same page. The fat donkey sitting on the pathway however is America. With a weakened America, it will allow us to stride about the lands in honor, with the permission of Allah." The magazine also takes the time to address readers' questions about the group's philosophy, including those who reject the organization. Moderate Muslim Imran Khan, in a letter to the magazine, challenges the notions that America and the West are at war. "If you're implying that since Muslims in America are living peacefully and are not being mass slaughtered by Obama, then we say to you: Obama doesn't have to kill all the Muslims in America or even a single one for you to say that he's against Islam," the magazine responds to Khan. "Rather, Obama can say things like, 'the terrorists want shari'ah law,' 'they want a global caliphate,' 'they don't practice the true Islam; they are not Muslims,' and so on, and that would by default put him at war with Islam because he wants a type of Islam that Allah didn't choose for us to follow." "For us to say that Obama is waging war against Islam, this doesn't fall under the news category; it is our worldview, which is actually shared by millions of Muslims across the globe who are not associated with al Qaeda or any jihadi groups." The magazine also reinforces AQAP's consistent message of "Open Source Jihad" directed at the West, with articles ranging from cleaning an AK-47 to advice about carrying out attacks in the West. The letters section redirects an aspiring jihadi to conduct his war on America instead of making the perilous journey overseas. "Your situation describes the same position that many other brothers in the West are going through," the article says. "They are ready to march forth but don't have the concrete steps to meet their mujahidin brothers. What we recommend is that you focus on planning out attacks in the West." "The foreign brothers that join the mujahidin, many amongst them, conclude that it would have been better for them to return to the West and launch operations. This is because killing 10 soldiers in America for example, is much more effective than killing 100 apostates in the Yemeni military." "With that said, based on your ability, you choose the target. Your pool of targets are large, so make sure to think of all of the available options. An example of something local, easy and effective is attacking an army recruiting center, nightclub, highway or busy shopping mall. Targets of greater difficulty, like the stock market, well-guarded individuals or intelligence agencies, will naturally require you to scout the enemy and area of attack thoroughly such as his movements, the cameras, security guards, secondary exits and so on," it continues. "One of the most effective things to do is to study past operations that failed and were done by individuals and small groups." The group also takes pride in how its magazine has been received, quoting from Western media. "They're not looking to outdo the readership of the Economist or Time magazine. They only need to inspire one or two people to blow something up in the right place and they'll make back their start-up costs," it states, paraphrasing an article in the Los Angeles Times.